Benin, formerly Dahomey, is a country in West Africa. It is bordered by Togo to the west, Nigeria to the east, and Burkina Faso and Niger to the north. A majority of the population live on its small southern coastline on the Bight of Benin, part of the Gulf of Guinea in the northernmost tropical portion of the Atlantic Ocean. The capital of Benin is Porto-Novo, but the seat of government is in Cotonou, the country's largest city and economic capital. Benin covers an area of approximately 115,000 square kilometers, with a population of approximately 9.98 million. Benin is a tropical, sub-Saharan nation, highly dependent on agriculture, with substantial employment and income arising from subsistence farming. The official language of Benin is French. However, indigenous languages such as Fon and Yoruba are commonly spoken. The largest religious group in Benin is Roman Catholicism, followed closely by Islam, Vodun and Protestantism. Benin is a member of the United Nations, the African Union, the Organisation of Islamic Cooperation, the South Atlantic Peace and Cooperation Zone, La Francophonie, the Community of Sahel-Saharan States, the African Petroleum Producers Association and the Niger Basin Authority. From the 17th to the 19th century, the main political entities in the area were the Kingdom of Dahomey along with the city-state of Porto-Novo and a large area with many different tribes to the north. This region was referred to as the Slave Coast from as early as the 17th century due to the large number of slaves shipped to the New World during the Trans-Atlantic slave trade. After slavery was abolished, France took over the country and renamed it French Dahomey. In 1960, Dahomey gained full independence from France, and had a tumultuous period with many different democratic governments, many military coups and military governments. A Marxist–Leninist state called the People's Republic of Benin existed between 1975 and 1990. 14.12.1984 "Dinosaurs" ? ?.08.1985 "Dinosaurs"  ??.? ?.1994 "Dinosaurs"
??.? ?.1995 "Rhamphorhynchus" 30.08.1996 "Prehistoric animals" 25.07.1998 "Dinosaurs"
??.? ?.2000 "Prehistoric animals" [A2] ? ?.12.2008 "Tyrannosaurus " ? 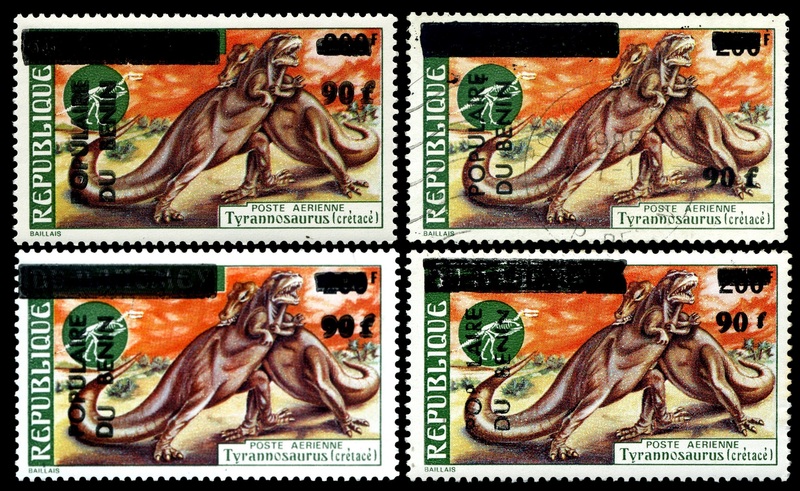 ?.04.2009 "Stegosaurus "
 Overprint of Dahomey stamp from 1974, the only Dahomey's stamps set related to Paleontology. There are many variation in overprinted stamps, diffentiated by position of country name on the left side and position of new face value on top-right corner. 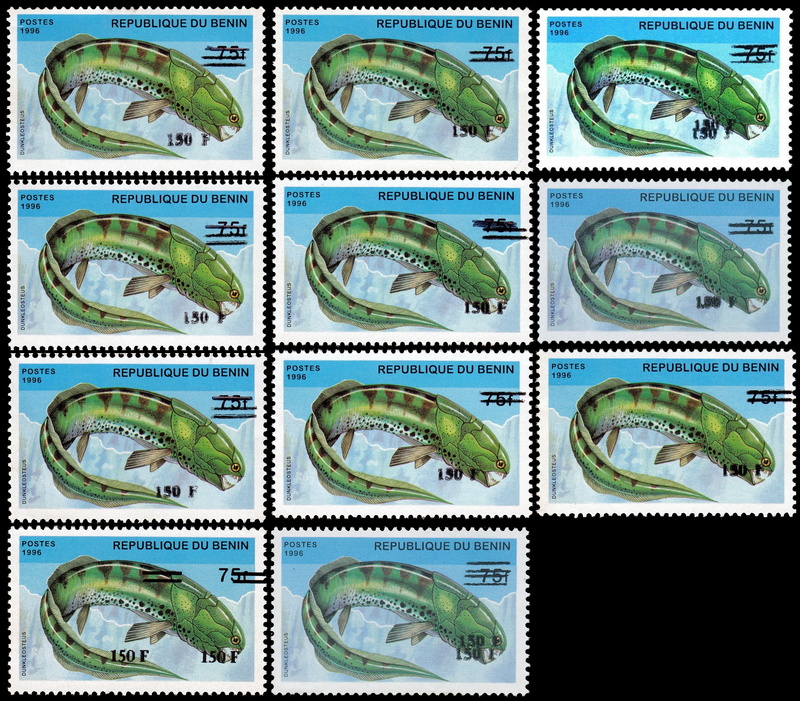 Here is example of shifted test on stamps of Stegosaurus. 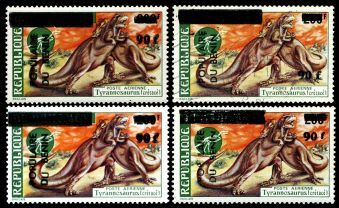 [A2] Overprinted stamps from "Prehistoric animals" stamps from 1996. 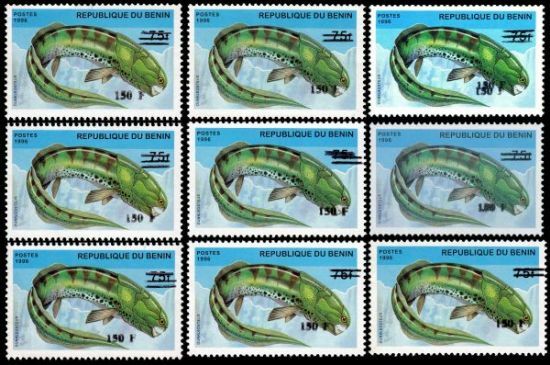 Stamp of Longisquama is very rare, stamp of Dunkleosteus is also rare but still can be found in some post offices in Benin even in 2018 and can be used for postage. Similar to overprinted stamps from 1985 these stamps also have many variations of surcharged text as on examples below.